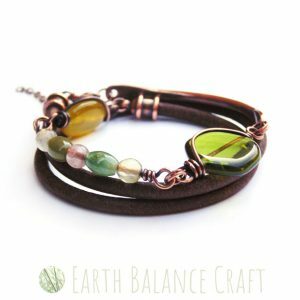 This pretty Bohemian wrap bracelet features fluorite, serpentine and agate gemstones and Czech glass beads, with a hammered curved copper bar and dark antiqued leather. The colour palette is reminiscent of forest walks and leafy woodland strolls with green earthy tones. The gemstone bar and the copper bar are both designed with a slight curve to sit comfortably against your skin. 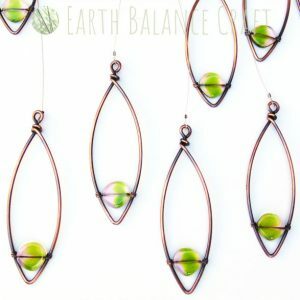 An abstract copper hanging mobile featuring dangling leaf shaped droplets adorned with pretty Czech glass beads. The design is inspired by spring time blooms, when zesty green leaves appear around the forest. With a soft green colour palette and dramatic leaf shapes, this hanging mobile is for all forest dwellers and woodland spirits out there. Come and wander in the woods with my range of nature inspired home decor. 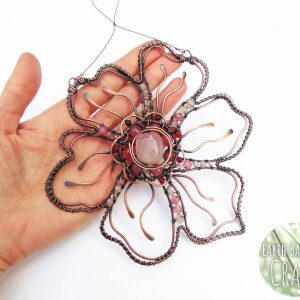 This suncatcher features cherry blossom flowers and petals adorned with pretty pink gemstone and glass beads. The crescent shape creates a wreath of pretty flower petals that would look beautiful with sunny sparkles hanging in a lounge window. The design is inspired by the height of spring when the air is filled with nature’s confetti as the wind blows tree blossom to the floor. An artisan creation, designed to become an heirloom piece that will last for years to come. This colourful copper love heart hanging decoration is adorned with a variety of blue gemstones and Czech glass. Inspired by the delicate British bluebell wildflower, with it’s pretty hues of cobalt blue, cornflower blue and tones of lilac. The forest aroma when carpeted with wild bluebells is one of my favourite experiences of the year, every April I wait patiently for them to appear. 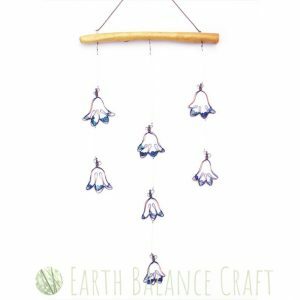 This blue suncatcher can be hung in your window for reflective sparkles or out in the garden for year round colour. This pretty Bohemian leather wrap bracelet features a spring green colour palette of gemstones with aventurine and prehnite beads. The design features a curved beaded copper bar, with rustic antiqued leather and hand forged copper and gemstone droplets. Inspired by my love of spring time forest walks and leafy woodland strolls. A delicate copper wire leaf design with dreamy moonstone, watery pastel green prehnite, rainbow fluorite and labradorite semi-precious gemstones. The feature lays asymmetrically across the neckline. Inspired by the beauty found in tree leaves, this piece picks out the tones of a leaf caught in a stream, with gentle droplets of dew from the early morning mist. We love the dew drop watery essence of this wire necklace design, capturing the essence of the natural world in women’s jewellery. This matching jewellery set features three ‘Snow Drop’ buds, just before they blossom into life. Handmade with patina copper, rainbow moonstone and a tiny wire wrapping technique that binds the gemstones gently. Inspired by the end of winter, when the first signs of life start to appear in the forest.